The beautiful, fruit-bearing North American persimmon is a deciduous shade tree native across much of the eastern United States with some disjunct populations in the West. Mature specimens become quite large and attractive, but trees are slow to reach maturity and can be quite weedy when young forming dense thickets where birds and other wildlife drop their seeds. 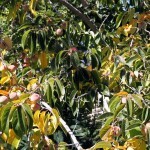 The small, astringent, bright orange persimmons are produced in fall and delicious when cooked or added to baked goods. They are inedible before fully ripe but sweeten up after hard frost. 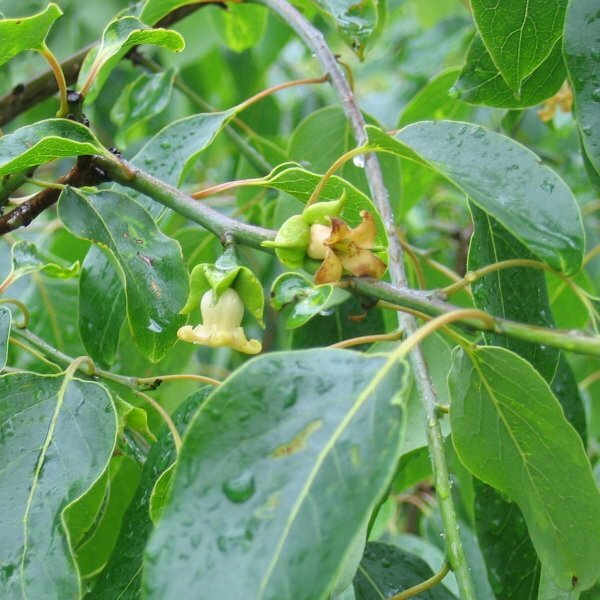 In the wild, the common persimmon can be found growing in both upland and lowland hardwood and coniferous forests. 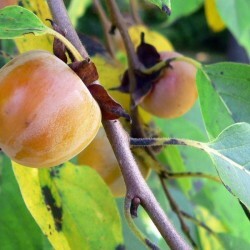 Common persimmon trees have deep taproots and strong, straight trunks lined with dark, blocky, almost checkered bark. Their simple, elliptical leaves are medium green and turn shades of yellow, orange and red in fall. 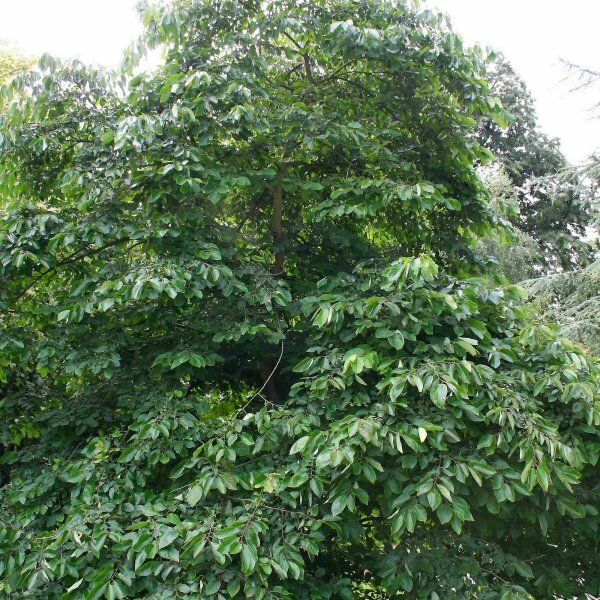 The trees are dioecious, meaning some trees have male flowers and others have female. 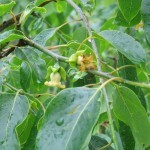 All the flowers are small, urn-shaped, brownish yellow and produced in late spring. The male, or staminate, flowers are small and in clusters of two to three while the female blooms are borne individually. The waxy orange fruits are flattened spherical berries with leafy tops and eight flattened seeds inside. They are thick-skinned and inedible until they soften after hard frost. Wildlife relish the fruits. For best fruiting, plant this tree in full to partial sun. Overall, common persimmons are adaptable and may be planted in many soil types as long as they are not too wet. Specimen trees look best if grown in open lawns. Female trees are pretty but messy in fall. In the wild, fruits vary widely in quality. On one tree they may be delicious when ripe, on another barely edible. The same is true of trees grown from seed. 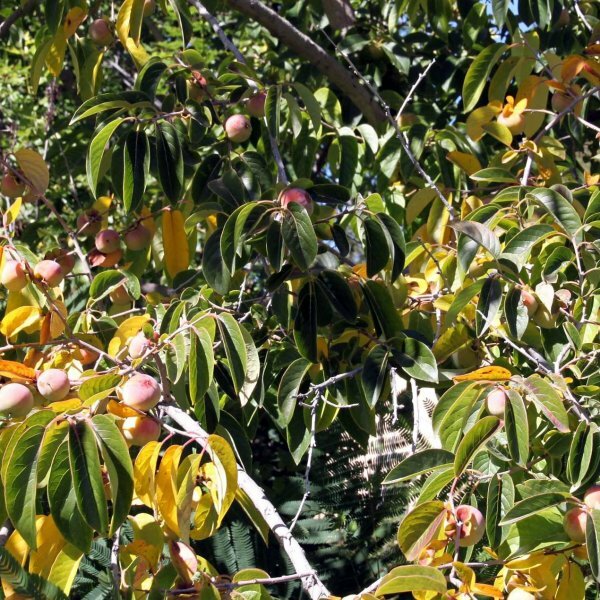 A few cultivars, selected for the size and flavor of their fruits, are available from nurseries that specialize in fruiting shrubs and trees. Some of these are purported to be self-fruitful.